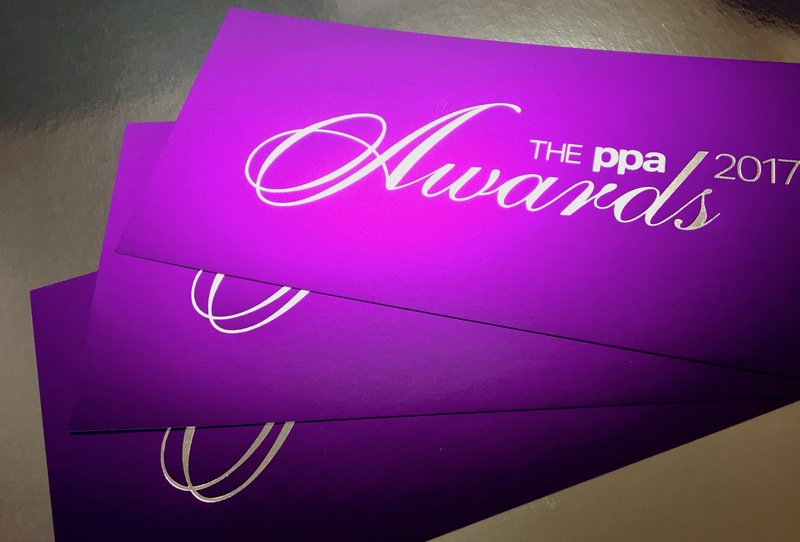 On Thursday 29th June we attended the annual PPA Awards at London’s Grosvenor Hotel. It’s a great event with delicious food, drink, entertainment, and a great chance to network if you can tear yourself away from the dance floor at the end of the night! This year’s awards were hosted by none other than comedian Katherine Ryan. As a sponsor of the PPA, we were asked to produce the invite for the ceremony, which is always a pleasure as we get the chance to create a lovely piece using our products and finishes. To create the invite, we had the information for the night litho printed onto the reverse of Mirri H Purple card stock. When the printed sheets came back to us here at our Reading site, the text to the front was foiled on using Cellofoil in Silver. To finish, a matt anti-scuff lamination was applied on top of the Mirri. This creates a soft, luxurious look to the Mirri, an ideal finish for an awards ceremony invite. The anti-scuff lamination also adds protection from scuffs and finger print marks, which is perfect for an item that is going to be handled a lot. Once we’d finished nibbling on our herb crusted chicken supreme, it was time for the awards to be announced. We had the honour of presenting the award for Designer of the Year (Business Media), which went to Tom Carpenter, The Architectural Review, EMAP. Other awards for the night included Customer Magazine of the Year, won by Sainsbury’s Magazine, Seven. Writer of the Year (Consumer Media), which went to Stuart McGurk, GQ, The Condé Nast Publications. And front cover of the year, chosen by the public, which was awarded to ShortList, Shortlist Media. The cover featured a plasticine sculpture of Jeremy Clarkson’s head.